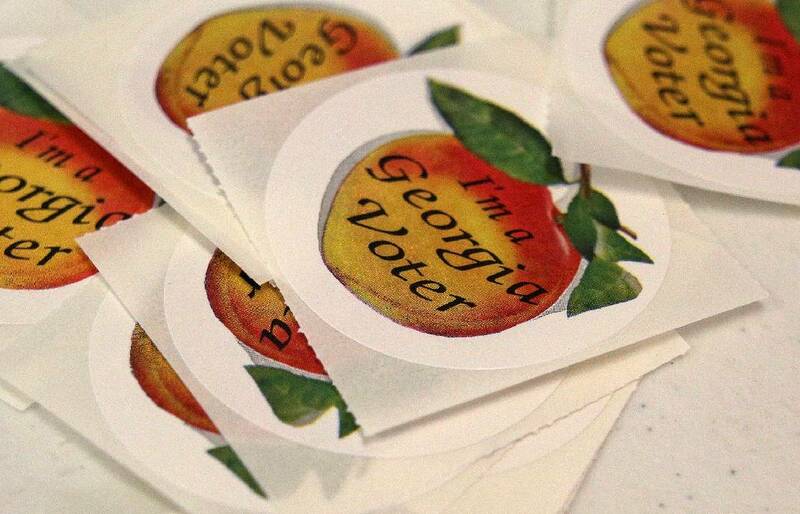 Staff photo by Erin O. Smith / Stickers sit on a table for voters as they leave the room after voting in the special election for the State House District 5 race at the Calhoun City Recreation Department Tuesday, January 8, 2019 in Calhoun, Georgia. The special election was held to fill the position, which was previously held by Rep. John Meadows, who died in November from cancer. The Georgia State House race to replace former Rules Committee Chairman John Meadows, R-Calhoun, will wrap up when polls close at 7 p.m. Tuesday. The special election runoff is between Matt Barton, a courtier business owner and former Calhoun city councilman, and attorney Jesse Vaughn. Vaughn has tripled Barton's fundraising in this competition and has the backing of Speaker of the House David Ralston and Meadows' family. Both now Republicans, Barton has attacked Vaughn for his previous support for the Democratic party, including an unsuccessful run as a liberal candidate in a 2002 state house race. Tuesday's special election is to fill Meadows' two-year term. A veteran of the legislature since 2005, Meadows easily won re-election last year but died a week later, on Nov. 13. Six candidates qualified for the race to take his seat. Of those, Vaughn was the top vote-getter in the Jan. 8 election with 33.7 percent of the vote, but his performance was not strong enough to avoid a runoff. Barton, who earned 23.2 percent of the vote, finished in second. Scott Tidwell, the third-place finisher, publicly backed Vaughn after privately telling Barton he was in his corner. Tidwell said he was at first dismissive of Vaughn, given his past record as a Democrat. But after a phone conversation and watching the two candidates at a Gordon County Republican Party forum, Tidwell said he felt Vaughn had a stronger grasp of policy issues important to most conservatives, from taxes and fees to gun rights issues. Vaughn said his backing from Ralston, one of the most powerful Republicans in the state, comes from a family relationship that dates back decades. Meadows' family has also been close to Vaughn's family, he said, and Vaughn's father spoke at Meadows' funeral. Two weeks ago, Vaughn attacked Barton for campaign mailers that say Barton slashed taxes during his time as a city councilman. In fact, the overall taxation in the city did increase slightly during his eight years in office, including a 15 percent bump in 2012. Barton argued that he is still a fiscal conservative, pointing out that the tax rate did hold steady or slightly decrease in five of his eight years as a councilman.